Once upon a time.. You decided it would be a smart idea to visit an old abandoned house.. Now your girlfriend has been kidnapped by a giant tentacle, and it's up to you to get her back! Mr. Runner is back and he's faster than ever! Leap over the spikes, sprint past the boosts, race through the desserts and forests until you've collected all the medals from Bronze to the elusive and secreted Platinum! Chase after the best time and don't worry about making a silly mistake because there are plenty of checkpoints to help you out along the way. 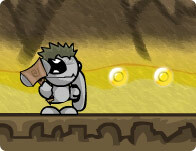 Use the Arrow Keys to run and jump through each platformer level. You don't want your burger in 60 minutes, you need it now. This is a puzzle, this is a race. This is everything all at once forever. A countdown to burger time! Awesome Run! Run as fast as you can, click on any button when the lights are green, and prove yourself! Run faster than the others, and avoid any obstacles in your way! Life has but a few rules: You outrun some, you steal from others and you stomp the rest. Live each of these principles in this fast paced platformer as you run, eat and smash your way to victory! We all knew Santa moved fast but no one could have guessed how fast. You have 60 seconds to finish this game or die trying. Run as far as you can and destroy the enemies on your way.